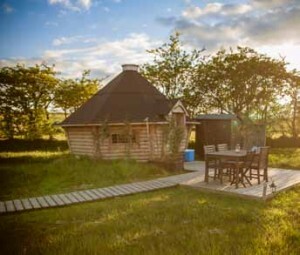 Bespoke yurts from Hearthworks can be customised to suit specific size and layout requirements and optional extras such as wood burning stoves can be included. Over the past few years we have seen a huge explosion in the popularity of glamping with all manner of yurts, shepherd huts, safari tents and camping pods popping up in quiet corners of the countryside. Farmers and landowners have been quick to cash in on the potential for diversification as an additional income stream by investing in units on their land. The obvious appeal for holidaymakers is that they can experience the great outdoors, while enjoying the luxury of a boutique hotel, coupled with rustic country charm. The UK festival scene has been one of the main pioneers in organising luxury temporary accommodation for those who aren’t so keen on the mud and the rise of the staycation has also helped push glamping to the forefront. Now holidaymakers can stay in a huge range of unusual accommodation and it’s this variety, uniqueness and creativity that has a strong appeal to the discerning traveller who wants to holiday somewhere where that will be a real talking point. Camping Cabins supplied a 17m2 cabin for Rivendale in April 2014. Constructed from sustainable redwood pine, the cabin has two side room extensions with two sets of bunk beds and a table and seating area. Since then, Rivendale has taken delivery of a 10m2 cabin that is used as a treatment room for the on-site spa and they have placed a further order for a 14m2 Camping Cabin to replace one of their existing canvas yurts. Greg adds: “The first Camping Cabin was a direct investment for the business. It is achieving around 50 per cent occupancy and with the costs of the fit out we envisage that the cabin will pay back in 16–18 months."